As expected, Mark Cavendish won Stage 6 comfortably in the end, while our other two picks - Nacer Bouhanni and Mattia Gavazzi - finishing 4th and 5th, just missing out on the each-way terms. 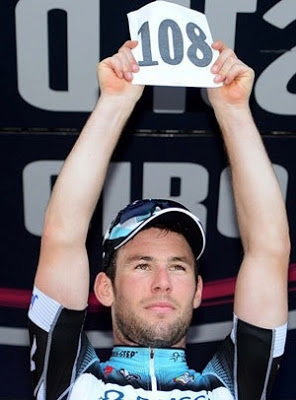 There was also a nice tribute to the late Wouter Weylandt, who passed away exactly two years ago in this race, when Cavendish held up the number 108 on the podium. Stage 7 is a far more difficult one to predict. It is a nasty, tiring stage ahead of Saturday's crucial time-trial and there are a number of ways that this stage could pan out. The first is that a breakaway group is allowed to go all the way to the end, providing there are no major challengers in the group. While it is always tough to predict which riders might be involved in a breakaway, there are a number of potential options that we shall look at. Another option is that Wiggins' main challengers might look to attack him on one of the short, sharp climbs toward the end. These are the types of climbs where the Englishman is vulnerable to the attacking climbing style of the likes of Nibali and Hesjedal. 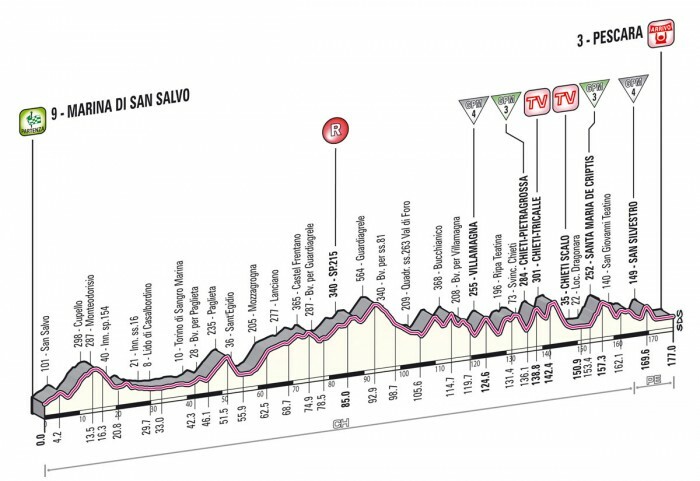 There are several sections of the climbs around Chieti, where the gradient reaches 20%, while the two final categorised climbs reached 18% and 14% respectively, allowing plenty of options to attack Wiggins and try to take some time out of him before the time-trial. However, if they are unable to shake him, we may see them going for the bonus seconds on the line again. In this situation, Cadel Evans must be one of the favourites, while Hesjedal has shown that he is keen to take some seconds as well. Mauro Santambrogio is another that must be kept in mind, given his strong finishing ability and desire to win a stage here. I suspect the second of those two options is the most likely scenario. Normally it is the type of stage where the breakaway could well survive, but with the race expected to be close, the bonus seconds have taken on a new importance. If the break survives, the challenge is to identify those riders that are likely to be part of that break. Nobody that is too close to the leader will be allowed to get away, so really we are looking at riders who are at least six or seven minutes back. The likes of Miguel Angel Rubiano Chavez, Marco Marcato, Matteo Rabbotini, Fabio Taborre, Pablo Lastras and Filippo Pozzato are all possible candidates, but it is tough to really predict who is likely to be involved. Giovanni Visconti is an obvious contender for this stage, although there are concerns about his condition after crashing in today's stage. He went to hospital for checks, but even if there are no problems, he may be stiff and find it tough for a couple of days. 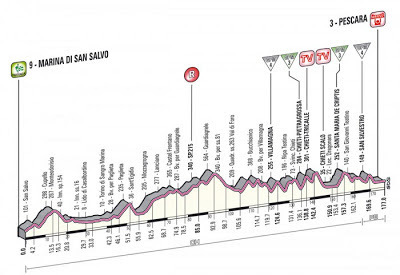 Should it come back together, expect to see Stefano Pirazzi try something on this stage with the mountain points available. However, it is more likely that he will look to take the mountain points before dropping back, unless he is able to get a reasonable gap. Another that has shown good form so far is Danilo Di Luca. He came close a few days ago and will be dangerous if he is able to find a gap as he did then. I am going to go with Rubiano Chavez and Fabio Taborre as potential winners from a breakaway group or to go away on one of the later climbs, while also covering Cadel Evans as a potential winner should a group of the GC contenders lead the stage home.